For my contribution to the Potrero Progressive Dinner, I had already decided to make some homemade pasta, so I wanted to top it with something worthy (i.e., something that took as much time to prepare and make). The tail of an ox (a castrated bull) certainly fit the bill, as it is tough at first, but becomes really tender with some slow cooking over a long period of time. And, don’t my friends deserve the finer things in life? 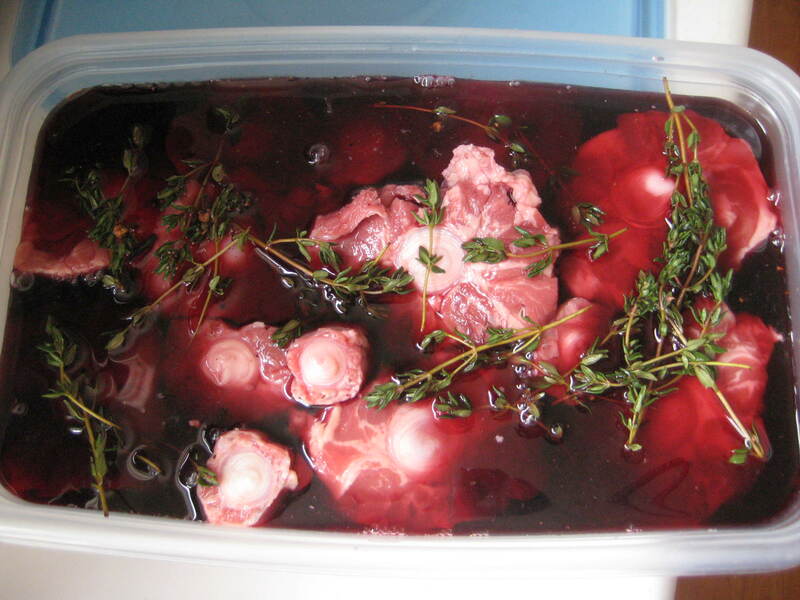 First, marinate the oxtail in a mixture consisting of a couple of cups of cold red wine and some salt and pepper. Also, add a few sprigs of fresh thyme. The liquid should go up at least half way up the oxtail. Put the oxtail and liquid in the refrigerator. Turn every couple of hours. After a few hours (about 5-6 hours for me) of marinating, remove the oxtail from the liquid (and reserve it) and then brown the oxtail in a Dutch oven with some oil (tongs are really helpful to pick up the oxtail), over medium-high heat (don’t use too high of a heat, otherwise the meat will get tough). Brown the oxtail on all sides and don’t crowd the oxtail in the pan – brown it in batches if necessary. When it’s done browning, set the oxtail aside. Also, don’t forget to preheat the oven to about 300 degrees (or lower if you have time). Using the same Dutch oven, which now has some oxtail juices, put in the onions, celery, carrots and fennel and cook a few minutes, until those are brown. Then, add the garlic, and cook for another 30 seconds or so. If necessary, add some more oil, so the mirepoix doesn’t burn. When that’s done, then pour in the marinating liquid, with another cup or so of red wine, to de-glaze the pot. Scrape the bottom of the pot to mix those loose bits in with all the other ingredients. Next, add the tomato paste (and diced tomatoes, if you have them). Then, add the oxtails, along with the spices (cloves, thyme, bay leaves, basil, salt, pepper, etc.). Ideally, use a cheesecloth to make an herb sachet (that way it’ll be easier to take out the herbs later). Put the Dutch oven, with the lid on, into the oven, and braise for at least 3-4 hours. Make sure the liquid goes at least halfway up the oxtails throughout the cooking process. If not, add more red wine as necessary. If you have time, then chill the oxtail overnight, so you can skim the fat off the top the next day. The next day, gently reheat the oxtail (about 200 degrees, give or take). [Note: If the oxtail is not tender yet, you can turn up the heat to about 350 degrees or so.] When the meat is tender enough to fall off the bone just by picking at it with a fork, then remove all the meat from the oxtail bones, and put the meat back into the pot. Continue heating that in the oven for another few hours. Finally, add salt and pepper to taste. This dish goes well with a healthy amount of pepper. I then served it over the homemade pasta, with some freshly grated Parmigiano-Reggiano. Sometimes, no matter how much you slow-cook some oxtails, it remains tough. Apparently, this happens if the tail comes from an old ox or if you brown the oxtail over too high of heat. Fortunately, the oxtail from Ranch 99 was fresh enough. Maybe it’s because Asian people are familiar with working with oxtail (my mom used to make oxtail soups, which I’ve also tried before) that there’s always a fresh supply. 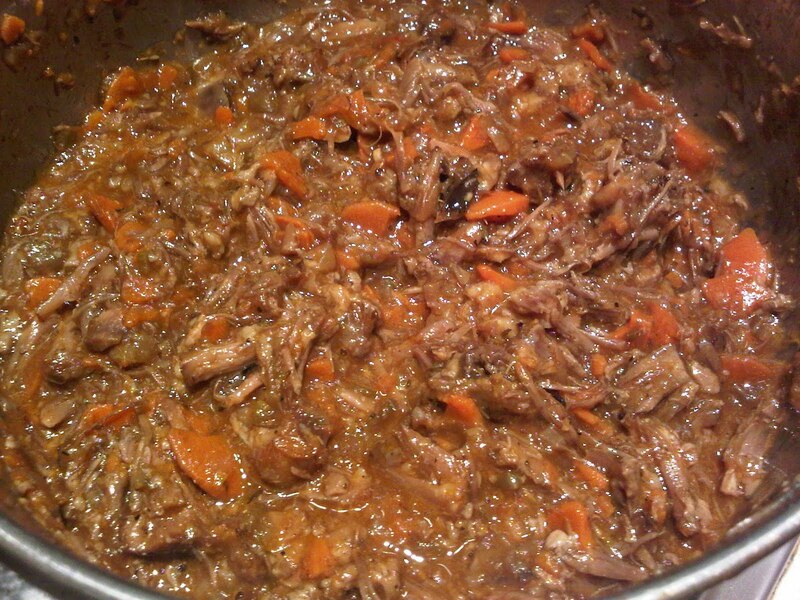 This entry was posted in Italian, Main Dish, Recipes and tagged Braised, Braising, Dutch Oven, Oxtail, Progressive Dinner. Bookmark the permalink.